Here comes the interesting update of our Million Dollar Rowdy Vijay Deverakonda’s next movie “NOTA” directed by Anand Shankar and produced by the prestigious Studio Green. This is a bilingual(Telugu and Tamil) and South India Sensation Vijay Deverakonda’s debut into Tamil Industry. Movie is touted to be an action packed political thriller which stars Mehreen Pirzada in the lead along with Sathyaraj, Nasser etc. 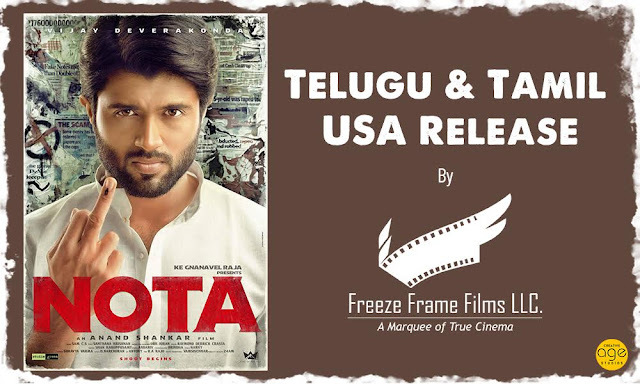 Freeze Frame Films, a leading distributor in the overseas market which already has rights of Vijay Deverakonda’s crazy adventurous ride ‘Taxiwaala’, is excited to secure USA rights of ‘NOTA’(Telugu & Tamil) as well. His no-nonsense look for the role of a politician has got a unanimous thumbs up and is one of the most awaited movies of the latest sensation. Overseas Heartthrob Vijay Devarakonda, who has three (Pellichoopulu (1.2 Million), Arjun Reddy (1.8 Million), Mahanati (2.5 million)) million dollar movies in the USA market is super excited with his lineup of movies. We sincerely thank Studio Green’s Gnanavelraja sir for giving us the opportunity to distribute NOTA(Telugu & Tamil) in the USA market. Stay tuned for interesting updates about this crazy project.